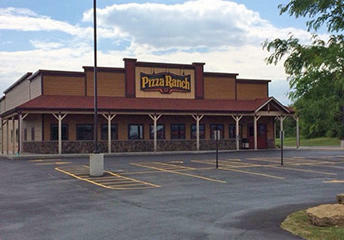 Pizza Ranch in Baraboo, WI | 916 Gateway Dr. Drink is included in buffet price. All prices listed are before tax and subject to change without notice. Lunch: $8.72Dinner/Weekend: $10.52Must be 65 years or older. Cannot be combined with other offers. Craving something mouthwatering? 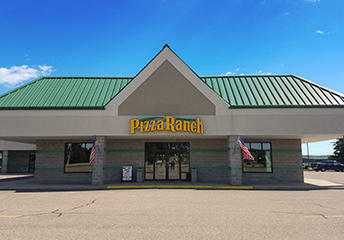 Visit Pizza Ranch to enjoy the best pizza buffet in Baraboo. Serve yourself up dozens of pizza choices, crispy chicken, fresh salads, piping hot sides and starters—and your favorite dessert pizza and ice cream! Get Buffet Your Way® or request delivery with convenient online ordering or call in. Planning a legendary get together? Grab the crew and schedule your next event in our community room that seats up to 48! We’re located just west of Country Road West and Highway 12, near shopping, golf courses, and close to Devil’s Lake State Park. Ask about fundraising with Community Impact events, too! 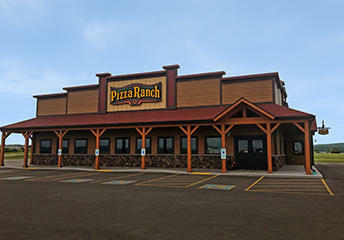 Pizza Ranch in Baraboo has been locally recognized! We want to thank the community for voting for us – you are what makes us legendary. Very good customer service! All the employees were very helpful and friendly!! Great food..Very pleasant people. Very friendly cashier. We really enjoyed it. LOVE that you play Christian music!!!!! Prompt service, clean, friendly people, salad bar kept filled, clean and organized. This is normal here, and make it that way daily. Food was great, and everyone was so nice! Shirley Z, thank you so much for sharing! At Pizza Ranch, we work hard to provide exceptional service and delicious food for our guests. We always appreciate feedback and will share this with our team. Friendly and helpful service all around restaurant. Not enough variety. Pizza was not HOT! The food was very delicious, especially the chicken. You did a great job on making my specialty pizza. The food was very hot as well. Job well done! Marinara sauce is sooooo peppery hot! It makes my eyes water and my lips burn. Food is not suppose to hurt. We are always very happy to eat here. The food and variety are delicious, and the customer service is excellent!